georgina marmoy. : Photowall Print & Discount Code! Photowall Print & Discount Code! I always love buying art for our house and I have lots of images on my Pinterest board of walls covered in art, but because of my renting restriction (we can't put lots of multiple holes in the walls), I have recently been looking for one lovely piece to cover the wall in my living room. So when Photowall got in touch and gifted me with a canvas of my choice, I couldn't wait for it to come through the post! Photowall has a range of canvas prints and canvas art to choose from. It also has a great option of being able to upload your own images to make into wallpaper or if you just need some inspiration of different styles to choose from it has hundreds of prints from artists and printmakers. The canvas comes flat packs and is easy to assemble (If I can do it, anyone can!) and whichever canvas you decide on, they all come in various sizes so you can pick the perfect one for your space. 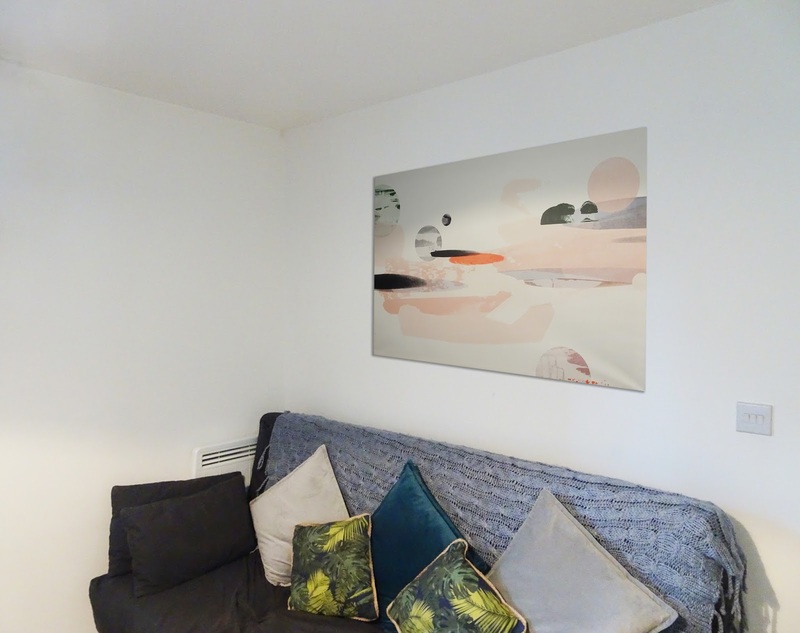 Photowall are a Swedish company that sell environmentally friendly wall murals and canvases, with high-quality prints from designers all across the world. 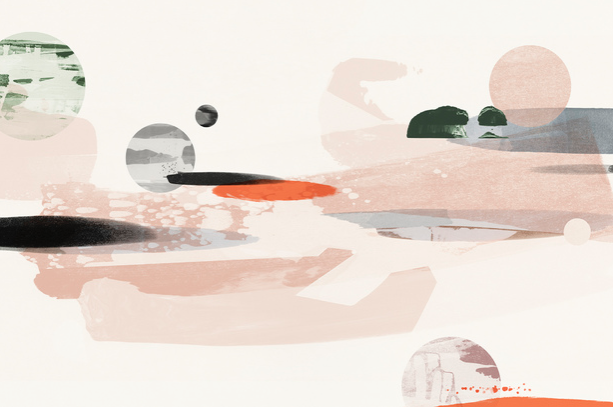 I decided on 'Cosmic Abstraction' for the abstract shapes and the tones - they go with the colours in my living room well. 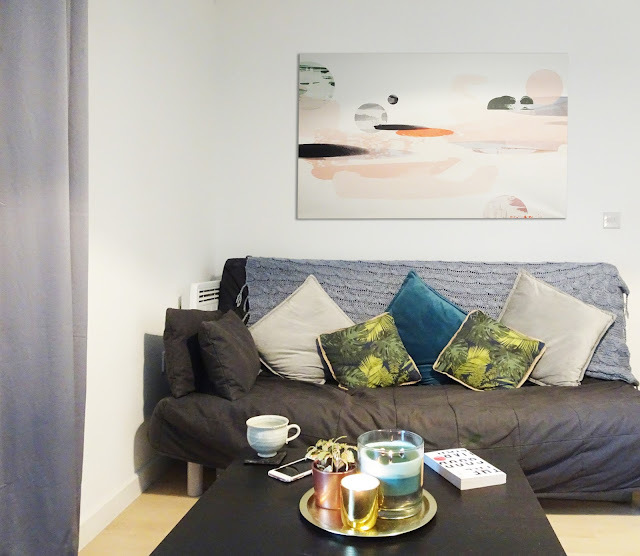 I love the look of it, with the abstract shapes in the main room of my home helping to bring out the colours in my cushions and throws (please ignore my sofa - a comes-with-the-flat furniture piece I have to live with!) My canvas arrived rolled up with a wooden frame in pieces, screws and a set of instructions. The wooden frame had peel away strips so it was just a case of building the frame and essentially sticking the canvas to the wood - super easy and simple! If you are looking for some pieces for your home or a gift from someone, I have the discount code 'GeorginaMarmoyCampaign2018' for 20% off! They have so many different designs, ideas and sizes (I took about an hour to choose the one I wanted - be warned!) you are bound to find something to liven up a blank wall! Shop here.